Monday, April 1 -- WestRock and AICC, The Independent Packaging Association, today announced an agreement whereby the company has committed 2.2 million tons of containerboard and paperboard grades over the next three years to the independent sector. The three-year agreement, which is effective April 1, 2019, through March 31, 2022, includes all containerboard and paperboard products that WestRock produces. AICC’s Board of Directors approved the new agreement in principle at a meeting held in January of this year, and AICC President Steve Young, acting on behalf of the AICC Board, and Jeff Chalovich, WestRock’s chief commercial officer and president of its corrugated packaging business. signed the agreement on Sunday, March 31. The agreement commits no fewer than 1,200,000 tons per year of containerboard and no fewer than 1,000,000 tons per year of paperboard grades. Under the terms of the commitment, containerboard includes linerboard, corrugating medium and white top products, while paperboard includes solid bleached sulfite (SBS), coated natural kraft (CNK®), uncoated recycled board (URB), and coated recycled board (CRB) products. AICC first contracted set-aside agreements in 1979 with major suppliers of linerboard and corrugating medium to help ensure that independents’ sources of containerboard would remain reliable in times of tight supply, or worse, major shortages. These agreements, which encourage individually negotiated agreements between a supplier and independent converters, are designed to help all independent corrugator operators, sheet suppliers and their sheet plant customers, and folding carton and rigid box makers. 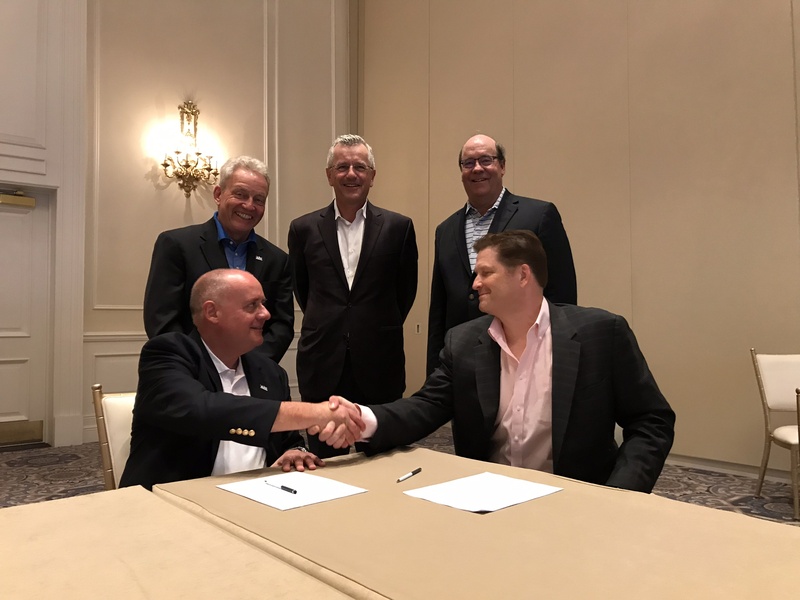 This is the third agreement AICC has signed with WestRock and its antecedent companies RockTenn, Kapstone, Smurfit-Stone and Solvay Paperboard. Other companies have in past years signed set-aside agreements with AICC, including Newman Paperboard, Kruger, Norampac and Greif. Set aside agreements do not replace individual supply contracts that independents may already have in place under terms that have been privately negotiated. For additional information on AICC’s set-aside agreements, please review the backgrounder which accompanies this release or contact Steve Young at (703) 535-1381, or syoung@aiccbox.org. What's a "Set Asside" Agreement? A “set-aside” agreement is an agreement reached between AICC and a major supplier of linerboard and/or medium in which the supplier agrees to “set aside” a stated volume of tonnage for the independent market. These agreements are designed to ensure that, in the event of a tight supply situation or other market disruption, independent corrugators and sheet feeders (as well as their independent sheet plant customers) will be protected and their supply of paper ensured. AICC backed away from set-aside agreements in 2003 when members of the Board of Directors at that time concluded that North American containerboard capacity additions and supply conditions were sufficient to ensure that independents would have adequate supply of paper at competitive prices. Recent industry consolidations, however, have raised concerns about market concentration in the containerboard sector and reliable sources of supply. AICC’s set-aside partners over the years include the following companies. Their effective dates and tonnage are provided. WestRock partners with our customers to provide differentiated paper and packaging solutions that help them win in the marketplace. WestRock’s team members support customers around the world from locations in North America, South America, Europe, Asia and Australia. Learn more at www.westrock.com. AICC is an international trade association representing independent corrugated, folding carton and rigid box manufacturers and their suppliers. For more information, go to www.aiccbox.org.